The premiere set for Rookie Card collectors is just around the corner. And when a product such as Bowman Chrome offers some of the most collectible Rookie Cards in the hobby, you can understand why there is such a buzz surrounding the product year after year. With past gems like the 2001 Albert Pujols Autographed Rookie Card, the 2001 Hank Blalock RC, the 2002 Joe Mauer Autographed RC, the 2002 David Wright Autographed RC and the 2003 Kevin Youkilis Autographed RC, collectors have come to learn - "Don't Doubt The Scout!" 2004 Bowman Chrome's 350-card set features 185 Rookie Cards including 20 autographed Rookie Cards at one per box - guaranteed. Some of the game's brightest prospects such as Dioner Navarro (Yankees), Felix Hernandez (Mariners), Shinjo Takatsu (White Sox), Tim Stauffer (Padres), Lastings Milledge (Mets) and Kyle Sleeth (Tigers) are among the 20 signers. And it would not be a Chrome line with out the Refractors. There are Refractor, X-Fractor and Gold Refractor parallels. There is even a special uncirculated Blue Refractor via redemption (hobby exclusive/thePit.com). This product features another special treat - a triple signed card featuring the first 3 picks of the 2003 Draft - Delmon Young, Kyle Sleeth and Tim Stauffer. There are also 2 other triple signed cards featuring Chris Lubanski/Ryan Harvey/Chad Cordero and Nick Markakis/Aaron Hill (2004 Futures Game MVP)/Eric Duncan. 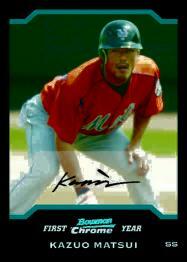 2004 Bowman Chrome Baseball hits hobby shelves August 11th and carries a $4.00 SRP for each 4-card pack. And each Hobby box guarantees 1 Autographed Rookie Card, 1 Uncirculated X-Fractor and 1 Uncirculated Blue Refractor redemption.